Remember when buying a desktop computer was simple? You'd stroll into your local electronics boutique, pick out the homely beige box with a logical moniker that perfectly complemented your needs (and a copy of Windows XP), and then head home, eager to begin what was sure to be an effortless setup and installation process. No? We don't either. The PC market has always been inundated with more options than the average shopper could hope to puzzle through, and the march of time has only complicated matters. Even the act of buying a desktop has been muddled, as towers of varying sizes have been joined by computers of entirely new designs. Fortunately, the most important choice you can make is also the easiest: Whatever shape, size, and price range you settle for, you'll want your new PC to run Windows 7. The disappointment of Vista is still fresh on many minds, but Microsoft's latest operating system offers improved performance, surpassing even the venerable Windows XP. And while each class of desktop offers divergent capabilities, strengths, and weaknesses, they also take advantage of Windows 7's features in their own ways. 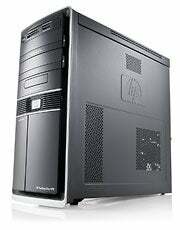 We tested a number of Windows 7-based desktop computers spanning the three major categories: compact PCs, all-in-ones, and the traditional tower. The six systems that we discuss here represent new and notable entries in each of those categories. The first step in buying a PC is identifying a need: Who is going to use the machine, and why? You might be tempted to buy Grandma an inexpensive e-mail appliance, to help her keep in touch. But what if she wants to stream Matlock in high definition to her living-room TV, edit and store terabytes of family photos, or video-blog her cooking show? A pricey, high-end desktop computer could handle those tasks with aplomb. The trick is to know what you want and, as a smart shopper, to find a machine that delivers exactly what you need in a convenient, cost-effective manner. 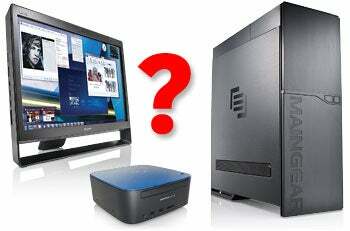 As the smallest members of the desktop family, compact (or "mini") PCs tend to favor size over performance. A combination of low-power, energy-efficient components and quiet operating decibels makes compact PCs cheap to purchase and affordable to maintain. You're likely to find them serving in small living rooms, as Internet access points, or deployed en masse in an office environment, where a low price and energy efficiency help the balance sheet. They also make handy companions for cash-strapped students. Many compact PCs come pitched as Lilliputian media dispensers. Equipped with power-efficient CPUs, HD-friendly integrated graphics, roomy hard drives, and HDMI connectors, they're designed to live beside (or behind) your television set, streaming Web content to your TV for a fraction of the cost of traditional set-top boxes or a cable subscription. Read our online stories "7 Savvy Tips for the Web Video Underground" and "Cable Cutters" for more on such uses. Compact PCs have become a good choice for home theater use in recent years, if you don't mind sacrificing a little processing power. Besides streaming content, they're a good set-top DVR alternative. 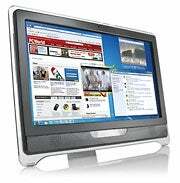 The mainstream editions of Windows 7 (Home Premium, Professional, and Ultimate) have Media Center software; this software, with a TV tuner in­­stalled in your PC, lets you watch and record television programs. You could also install DVR software such as SageTV or even the familiar TiVo interface. With Windows 7 alleviating much of the bloat associated with Vista, you can enjoy the operating system without dragging your little machine down. Sure, some mini-PCs still run Windows XP, much as their netbook counterparts do. And our tests show that Windows XP will perform slightly better on some Atom-based machines. But you would be missing out on the streamlined media-sharing experience afforded by Windows 7's HomeGroups and its Internet TV functionality, among other improvements. Check out the chart of our "Top 5 Compact Desktop PCs" to see our favorites in this category. A decidedly different approach to fitting PCs into small spaces is what's known as the all-in-one. These slender computers are essentially the laptops of the desktop world: Their components are built in behind their displays, giving you a full-fledged workstation with a minimal footprint. They're more than attractive. Many all-in-one PCs in­­clude touchscreens, which offer a novel way to interact with your computer. Windows 7 added native support for multitouch gestures, letting you navigate the operating system using natural hand motions. You can flick Web pages to travel back and forth through your browsing history, pan through documents with your fingers, or pinch images to zoom in on them, much as you would on an iPhone. Lower-end all-in-ones often sport screens with only single-touch capability, but more PC makers are taking advantage of Windows 7 by providing multitouch displays at a lower cost. With no cords to manage or peripherals to juggle, setting up an all-in-one PC can be as simple as pulling the machine out of the box and finding a power outlet. Just keep in mind, though, that this convenience can become a double-edged sword: As with laptops and most other self-contained gadgetry, you may find yourself out of luck if you decide later on that you would like to upgrade particular components. Cost and screen sizes vary. Depending on which is more important to you, browse to our "Best Big-Screen All-in-One PCs" chart or to our "Best Budget All-in-One PCs" chart. 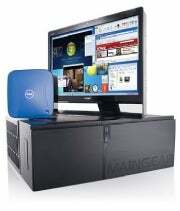 Tower PCs are the most familiar member of the desktop family, and their chief strength is versatility. You'll find desktops in all shapes and sizes: petite minitowers, gaming behemoths bedecked in LED bulbs, and the midsize tower, aimed at mainstream users. Need more room for your family photos, or music? Open up your case and add an extra hard drive. Has your machine lost its pep? Pop in a stick of RAM, or swap out an aging motherboard for a newer model. If you aren't afraid to get your hands a little dirty--or are willing to take your machine to a shop--no other category comes close to matching a tower desktop's flexibility. The right components can prepare your system to tackle almost any task, whether you're slaying dragons or rendering them. You'll want to get the best possible performance out of your workhorse, and Windows 7 is faster overall. But Microsoft has also reworked how the operating system runs multithreaded ap­­plications, such as image editors and games. This is an especially important change for computers that sport multicore processors--a feature of the great majority of new tower PCs--as they will see snappier performance under Windows 7 than under either Windows XP or Vista. On the other hand, a plethora of options isn't always a good thing. Tower systems are arguably the most confusing category of the desktop bunch, because the dizzying range of choices and price ranges here can have you buying far more machine than you need if you don't do your research. To narrow down your options, see our charts for our favorite budget, mainstream, and performance desktops. You have lots to consider when shopping for a new desktop. But take heart: The following pages can bring focus to your search and help you make the right choice.